Cabbage is a typical fall and winter vegetable. We love it not just because it contains lots of iron and vitamin A. Our cabbage salad is fresh, easy to make, gluten free and vegan. What else do you need for healthy living? 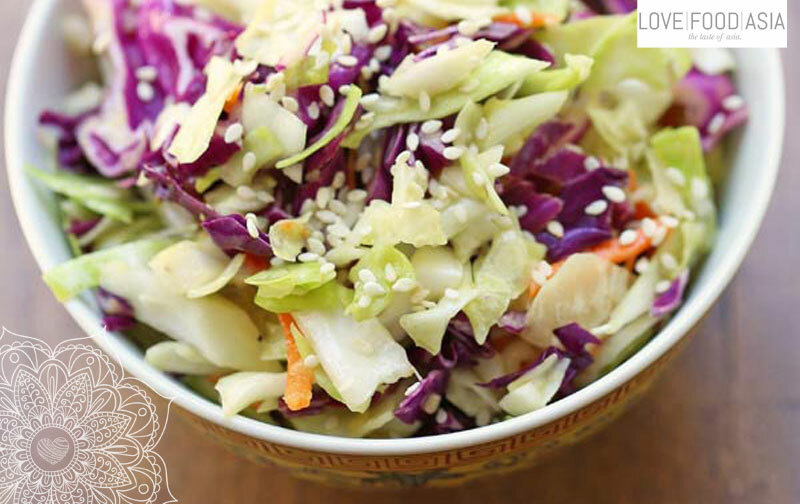 You will find thousands of cabbage recipes but this one is very influenced by the Asian cuisine and you can regulate the spice the way you like it. Put the soy sauce, vinegar, fizzy water, sesame oil, and palm sugar in a small pot over low heat. Heat, stirring, just until the sugar has fully dissolved. Shut down heat. Whisk in the olive oil and set aside to cool. Put the cabbage, carrot, sweet pepper, spring onions, almond and slivers in a salad bowl. Pour half of the dressing over and toss until every piece of vegetable is coated. Add more dressing until the salad is well dressed. The remaining dressing will keep in a sealed container in the fridge for at least 1 week. Set aside and soad noodles in hot water for 1 minute. Drain and set aside until cold. Mix salad and noodles and serve with sesame seeds.